Madara is Latvian for Cleaver – a plant that features a great deal in Madara cosmetics. Launched four years ago, Madara have released a capsule range of skin care and cosmetics concentrating on plant and herbal extracts which have weathered the short Latvian summers and the long, long Baltic winters. Prettily packaged – a nice change for an organic range! So many of them you buy for their worthiness rather than thair looks – in airtight vacuum containers, the range concentrates a great deal on moisturisers of differing intensities, and has a small range of cosmetic products such as tinted moisturisers and lip glosses. I saw the products at both The Vitality Show and The National Organic Products show this year, and I was impressed enough to want to give their tinted moisturiser a thorough look-over. Being slightly warm-toned, I chose their “Sunflower Tinting Fluid”, but there is also a “Moonflower Tinted Fluid” for cooler skintones. Sometimes, even a cool-toned gal wants a tinted moisturiser! Tints, illuminates and lightly moisturises the skin of the face and neck. Evens out skin tone. Gives the skin freshness, radiance, and the look of a summer tan. Disguises imperfections and fine lines. A lighter alternative to foundation. CONTAINS Baltic St.John’s-wort, plantain, chamomile, algae and rose water, as well as cocoa and jojoba. Colour and shimmer are obtained from natural plant minerals and mica. USAGE: Apply evenly to cleansed and toned face and neck. 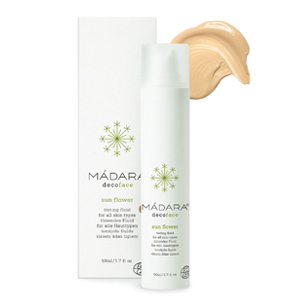 For deeper moisturization use MÁDARA moisturizing cream, fluid or gel beforehand. I’ve used this a lot in the weeks since it arrived, it’s light, fresh, easy to blend and melds well with the skin. Also, it’s not got a huge amount of pigment in, so it’s not going to turn you orange. It has a vague “green” scent, remiscent of grass and hay, but the smell doesn’t linger upon application. It also doesn’t leave you looking greasy! I like it a great deal, Madara say it’s suitable for all skin types, but I’d suggest that if you’re dryer skinned then you might have to use a regular moisturiser underneath, but as it is, it won’t clog up the pores if you’re slightly oiler-skinned, which is nice. Sadly, like many organic moisturisers, it doesn’t contain an SPF, so you will have to use a separate product for that, which is a bit of a pain – it’s also the reason why this won’t be knocking my beloved Bobbi Brown Tinted Moisturising Balm of it’s perch at any time in the near future – but, whenever I’ve worn this my skin has looked great, even with just a tiny touch of HD powder over the top, and it’s light, long-lasting and easy to wear. The Fine Print: Review based on samples acquired from a variety of sources. I cannot reveal my sources, because then I’d have to kill you.